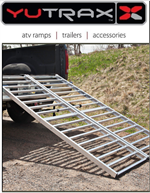 All YUTRAX Ramps feature lightweight aluminum construction, rubber-coated tabs to protect tailgates, and on folding ramps, heavy-duty welded hinges. 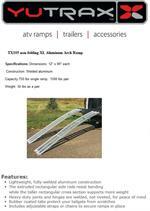 YUTRAX ramps employ fully welded construction to ensure they’ll be sturdy for years to come. 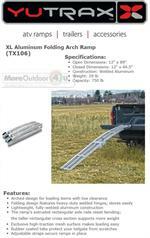 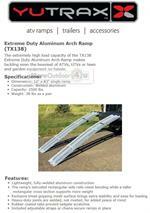 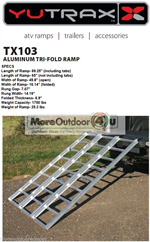 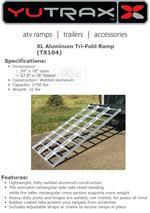 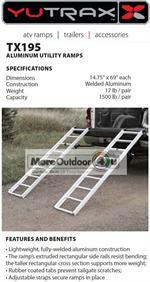 TX138 Extreme Duty Aluminum Arch Ramps 12" x 83"
TX108 YUTRAX ALUMINUM BI-FOLD RAMP 50"X 85"
TX195 YUTRAX Aluminum Utility Ramps 14.75" x 69"